Although summer is not over, fall is fast approaching and we all know what that means! Well, if you don’t, it means it’s time for a new hair style and a new hair care line to try! Changing your hair care routine as often as the seasons change is a good way to keep your hair balanced and refreshed when trying new products. Most heads are dry, thick, and brittle after the summer is over due to the excessive heat, chlorine, and salt water. 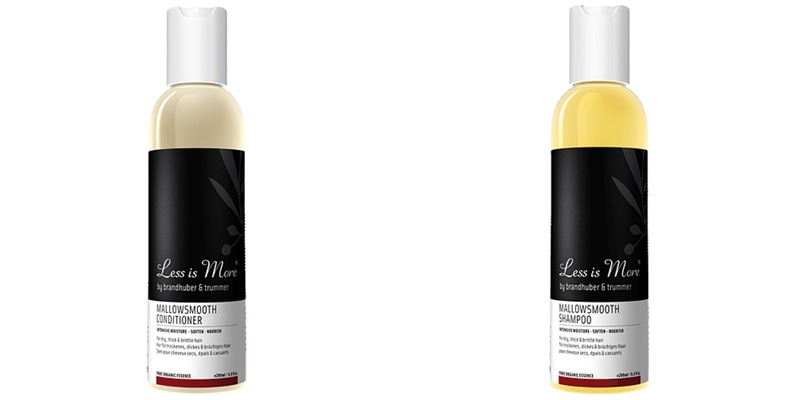 If that is the case for you or someone you know, Less Is More Organic HairCare has the perfect line to switch up what you use and how you use it. The best part is that they have something for all hair types. Mallowsmooth Shampoo – Intensively moisturizing sulfate-free formula softens and smooths particularly dry, thick, and brittle hair, also protecting those particular hair types from drying out. The aromatic benefit: 100% organic essences such as Palmarosa, Ylang Ylang, Rose Geranium, and Orange. This product is certified organic, sensual, indulgent, harmonizing, and scalp soothing. Mallowsmooth Conditioner – This rich intensive Conditioner especially nourishes dry, thick, or brittle hair, making it soft and silky. It smooths the hair structure, gives hair moisture, and improves comb-ability. The aromatic benefit: 100% organic essences such as Ylang Ylang, Palmarosa, Rose Geranium, and Tangerine. This product is sensual, indulgent, harmonizing, and scalp soothing. ProteinSpray – Lightweight moisturizing Spray that gives the hair a soft texture and tames flyaway hairs. This Spray is suitable as a cutting lotion, sprays evenly onto damp hair before styling, and is also efficient for refreshing your style or if your scalp is tense. Shake well before using! The aromatic benefit: 100% organic essences such as Rose Geranium, Ylang Ylang, and Orange. This product is certified organic, mood brightening, balancing, indulgen, and scalp soothing. Angelroot Volume Spray – The styling Spray and root-lifting booster creates maximum volume without weighing down the hair. It gives strength and body, as well as a healthy shine to the hair while remaining anti-static. The aromatic benefit: 100% certified organic essences such as Angelroot, Sicilian Lemon, and Melissa. This product is certified organic, strengthening, uplifting, mood brightening, and scalp toning. 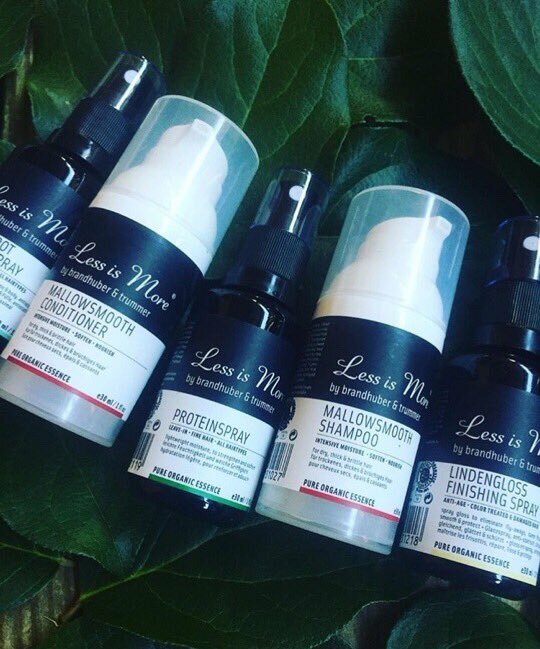 Lindengloss Finishing Spray – Glossing Spray to smooth and protect colored and stressed hair in particular, smoothing the hair structure, and has an anti-static and anti-oxidation effect. The aromatic benefit: 100% organic essences such as Linden Flower, Petitgrain, Bigarade, Atlas Cedar, and Douglas Fir. This product is certified organic, mood brightening, elegant, and scalp relaxing. This MiniBrush Fushia Brush is handbag-sized, mini, made from beech, natural rubber, FSC certified, and heat resistant nylon. 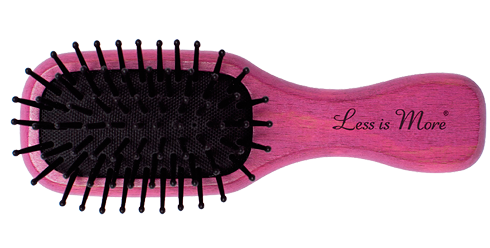 This Brush is perfect for a quick touch up or even a long sit down of combing through your hair. 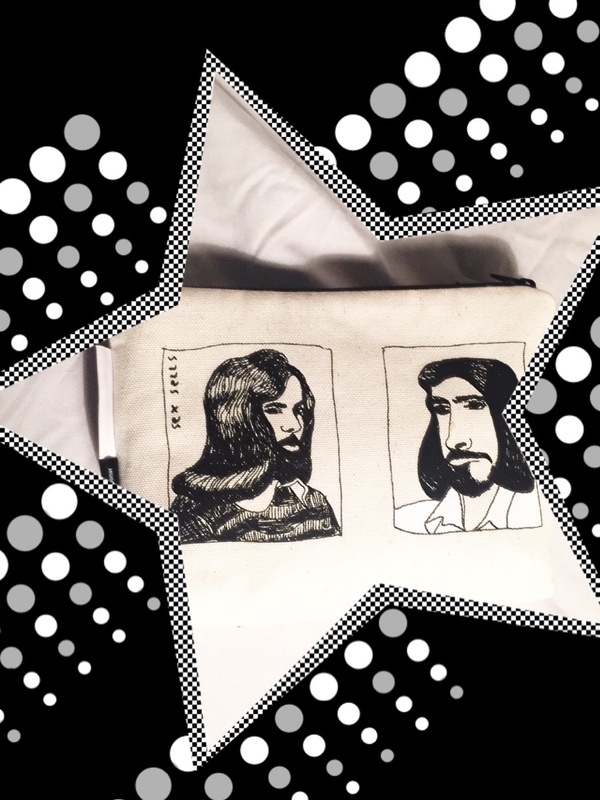 This Pouch-Titanilla Eisenhart Bag is a limited edition Bag. 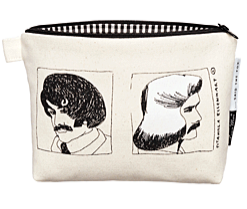 Made from organic cotton, printed by hand using eco-friendly water based inks, this Bag is the perfet fit for your mini brush as well as any small-sized beauty products you’d want to fit in for your liking. Less Is More impressively has been noticed and acknowledged by popular magazines such as Glamour, InStyle, OK!, GQ, Elle, and more! 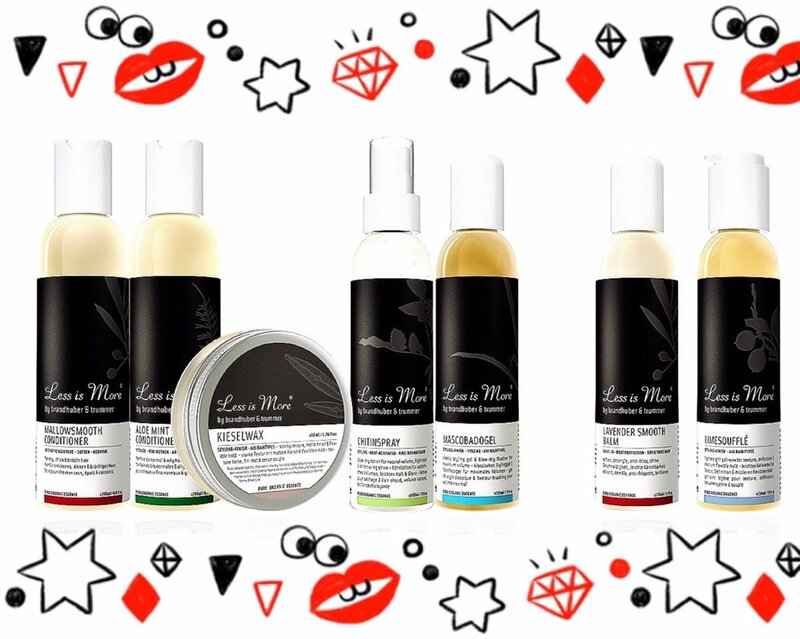 Less Is More gives organic hair care a great name and we Experts here at Mytopface are so pleased to have our hair refreshed and back to life. Our travel-sized products make traveling so much easier, and our new Bag makes everything more manageable to lug around. All products are cruelty-free, which is an added bonus to every other flawless advantage of this line. Once your hair is back in check and you are ready to style it, Haute Air in Soho has an amazing trick to show the world on how to achieve a Haute Air Victoria Secret Blowout, and we have all of the inside scoop.